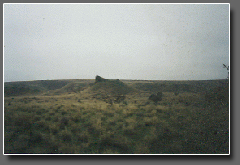 This page contains many new pictures (May 2003), Pyramids included. Scroll down to see. This and other crystal skulls are in the care of the Twisted Hair Society of the Cherokee. Red Elk is an honorary member of this society. This is in the Mt Baker area. It has a road going direct to the base of one of the sides, then stops. THESE HAVE DOORS FOR ENTRY ... Military. There are other such places throughout America, not necessarily into pyramids. The dark mound on the left is a pyramid eroded by eons of wind. 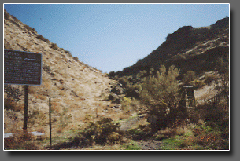 This is at the Yakima Firing Range, between Ellensburg, WA and Yakima, WA. They can be best and easily observed from the South lane rest stop (I-82). The military had gotten inside this one long ago and are, as usual, misusing. Can you spot the pyramid in this picture? There are literally hundreds of pyramids across the USA, Canada, and our Earth. Most are made via a sound-laser device set on a four-legged tripod set at certain angles. On two of the four angles, a small box about 4 to 5-1/2 inches wide and 8-1/2 inches long, and approximately 7-1/2 to 8 inches high would be slowly lowered downward on two of the angled legs. As this did so, it would emit a laser SOUND. This would carve a hill into the proper shape needed. Meanwhile, our people (Indians) would carry away pieces of rock and spread them some distance away, until all that remained were the pyramid shapes. 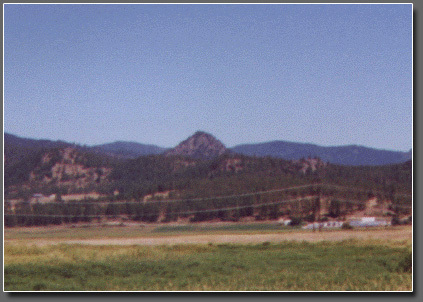 The pyramid shown in these pictures can be seen on the highway between Spokane and Chewelah, WA. 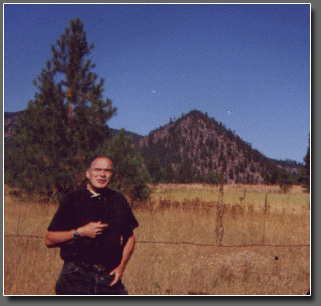 On the right, going towards Colville, WA, just as you pass and go down the hill where Ft. Spokane Park is.Where the Giza pyramids are, there were no hills to carve. The stones were brought in and artificial pyramids were made.All pyramids are built on semi-precious/precious stones/gold and silver deposits, etc, that lie on important laylines worldwide. The Aztec-Mayan pyramids were built in an attempt to re-create what the "gods" had done as well as to give honor TO the gods. They had the memories but not the full knowledge. Many of the Inner World (Number 5 Earth) hold similar pyramids of a cross between Mayan-Aztec and those here on our surface. These "inner" pyramids are the center focal point of these cities, a number of which (cities) were destroyed in the war between the Dracolian Lizard Race and our Number 6 Surface Gods we call 'The Slope Heads'. 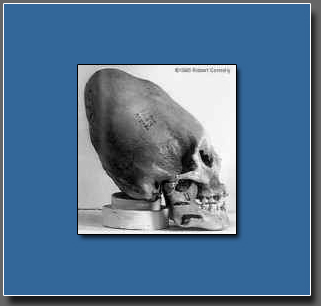 Photograph of a Slope Head skull. 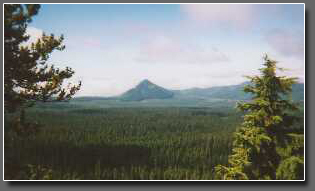 At Chewelah pyramid, approximately 1-1/4 mile from its base. This pyramid is surrounded by private property. The Easter Island Carved Heads are carved after these Slope Heads. 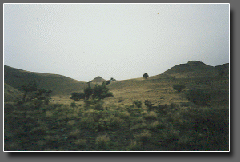 Easter Island used to be the Slope Heads' main domain. These "gods", at maturity, were 22- to 24-feet tall. A 27-foot 'giant' would occasionally be seen. These people were (and are) from another dimension.... Not of our galaxies. Some pyramids are 'working' pyramids, sending off their energies to 'slave' (or 'worker') pyramids. The working pyramids emit an actual energy source of extreme high frequency. This energy is then 'mirrored' to the 'workers'. This energy creates wellness, well being, peace, etc, around it. At this moment, our planet is in such bad shape that though now the energy is once again being sent, it is disrupting the 'Karma' that has been built up over several centuries. It is like spreading a scabbed wound open ... It hurts, but in the long run, it cleanses.It takes two to realign the equipment that the main pyramids contain. Only women of a certain high energy balance can be used on this. This is one of those women. Other energy balances (women) are used in other works, such as Earth healing vortex repairs. Three of 16 clouds counted on the way home early the next morning. 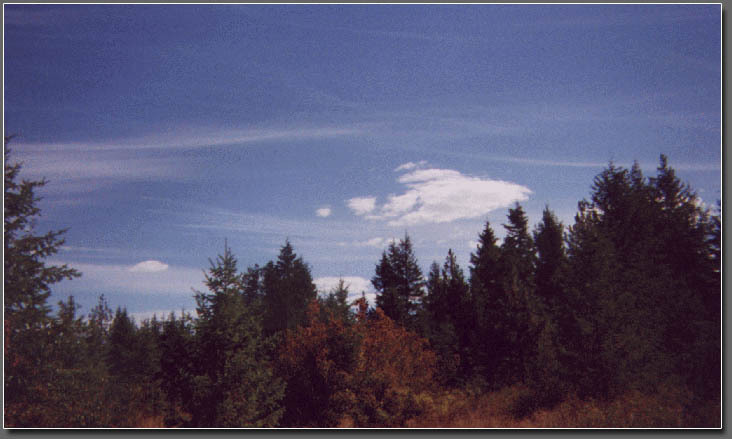 Note: The clouds pull in distant clouds like pulling cotton candy off its main source. Each cloud ends up looking similar to a large pressed marshmallow, and each cloud is directly above a mirror pyramid. 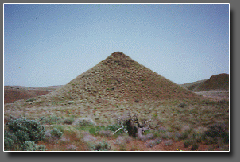 This set of pictures shows just one of many pyramids in Washington State. The Forbidden Pyramids -- Keep AWAY! 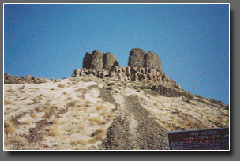 This set of rocks is called the Twin Sisters, on the Oregon side of Washington State, not far from Kennewick. 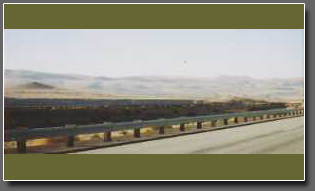 Highway alongside the Columbia River. Whoever told the parks department this tale was pulling their leg. These two stones are three falcons. The one on the left is a falcon with wings outstretched. The one on the right two falcons perched close together. The wind has eroded the front, but not the back. There is quite a story to this area, and one day Red Elk may tell the truth about what all of this was about. Above is the ravine that leads to a set of three pyramids of identical size. STAY AWAY. You are on a US Military "Non Existent" base and they WILL shoot. 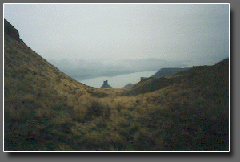 The hill on the right in the above photo is called the "Whale Back". In the center, you can see the pyramid. If you're foolish enough to go up the ravine and climb to the right, you'll see another fence ahead. You're already in trouble if you've gotten this far in the first place. Don't go any further! There's a reason for this hill, which may be revealed at another day by Red Elk. 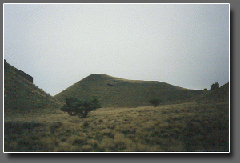 On this hill space craft, whose bottoms were shaped to fit exactly to the shape of the hill, would land, load and unload. All of these pictures, above and below, are an ancient site before the last earth flip. If you look closely to the right of the 'landing pad', you'll see a series of bumps. This was made to hold grains and foodstuffs, and graduates upward with a walking wall between each. This is the back view of the so-called 'Twin Sisters', taken from the base of the pyramid below. This is THE pyramid of all the above photos/area. There are two more identical further around the gully, which is shaped like a hook. These three pyramids are 60-feet tall, 60-feet on two sides, 40-feet on two sides. Note: There is yet a 4th 'something' of identical sides, that make these three pyramids look like a marble next to a soccer ball. It cannot be seen from this area. It's approximately 2 miles further on. 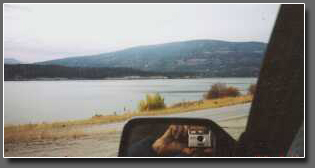 All Red Elk can say about it is that a Soviet satellite photo shows that this big 'whatever' exists. It might be flat topped. Again, I warn all, this is no game. You cross fence here and it is quite likely you will never be seen again. STAY AWAY! Here is the only opening above water. (Since rockslide covered) There were three underwater entries, now blown shut when this base was abandoned. The people of this underground base, some 90 feet below the surface, are/were very "Germanic" (ie: WWII) like beings. Extremely thick hair, strawberry blonde, short (approximately 5' 3"), feet like goats (they wore cowboy boots to conceal and keep their feet in). Deep voices. Very cocky, and it is not at all unusual for them to come out into a town or city and do business therein. 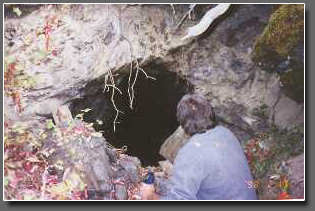 I discovered these via local Native Americans who had many legends concerning this area. I checked, found out, and faced these beings. Upon their discovery and upon finding out who I was and who I worked with, within 3 weeks this base was totally abandoned. The dark line of hill, center left, contained photographic equipment that could see through rocks and keep track of all traffic close to the base, such as where I am parked for this picture. Inside their base, towards the ceiling on angles were monitors that included this particular camera, as well as a number of others. On top of that there were two "Borg like" families, occupying the 2 houses closest to this base area. One overlooked the base per se. The other overlooked the other underwater openings. Upon abandonment these "people" left as well.